The effect of the economy on tourism here shows not only in the retail numbers, but we can see the difference in the numbers of vacationers at church. But while their numbers are down, their enthusiasm is not! Some of the best people I've ever met worship with us once a year when on vacation. I still have to marvel at the occasional tourists who wait until our first song to get up and leave! Our greeters are very good at suggesting a church for them (if asked). But, come on...when you look on the stage and see a keyboard, electric guitars and drums it should give a clue we're not going to be old school in our music. Then, when they leave and even if they find a close church more to their liking, they walk in late to that service. All that to say, when you you go on vacation and want to go to church do your homework in advance! NHC has the best Kids' church and nursery staff around. And the Kids' Zone volunteers look pretty sharp in their new team shirts. Looked like lots of coffee was being consumed this morning. I had two cups myself. Thanks to our hospitality team for coming early and staying late every week. Mike and his team were scrambling today both seating everyone and finding parking places. In a church where there are so many guests each week having a team dedicated to helping everyone find their way around is a necessity. I've been to churches as a visitor where no one welcomed me or gave me any direction at all. That's no fun! The MP 13 Band sounds great with the third vocalist we usually don't have. I'm looking forward to hearing a sax with them sometime soon. "You are Welcome Here, mighty God" is an awesome opening song, setting the tone for the rest of the worship. Matt, our intern has our podcast back in shape after some software problems. Thanks, Matt. 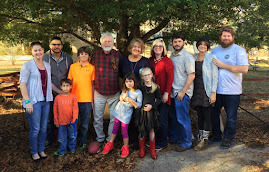 This week two of our missionary families arrive in town for extended stays. Welcome to the Glocks from France and the Bensons from Honduras. 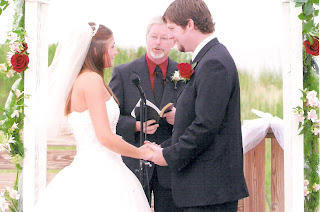 While I'm on the subject of marriages, a happy 5th anniversary to my son Nathan and his bride Tricia. We're all so happy and frankly amazed that you've reached this milestone. Your marriage has touched more people than you'll ever know. You can read Nate's post about their anniversary and see the video. If you don't know why this is so special, please visit here. Sorry this is posted so late, but it's been a long day! I'm blown away by what seems to be a rash of marriages crumbling around me. What's happening in the lives of South Carolina's governor and First Lady, even Jon and Kate seems to be part of an epidemic, especially among Christian couples. What gives? Friendships have to have proper boundaries. Your spouse should have a key to every door in your life and permission to look inside at any time. Work doesn't come first. Neither do your kids. God first. Spouse second. Then kids. Have someone in your life who can ask you the tough questions and hold you accountable. Finances and the stress they bring need to bring you together as a team, not divide you. Don't wait until it's "too late" to seek help. Do you want to have a healthy marriage or keep your pride intact? I'm aching inside for some couples I know, and praying for them to let God heal their fractured relationships. He can. Using David as an example of a father, who like all of us was less than perfect, we saw how he learned from his faults and failures and somehow continued to pursue God. Then he left a legacy and a dream to his son. Inserted in the message was a great cover by our band of the DC Talk song, "What if I Stumble?". Ministry teams were busy serving today. Our volunteer staff is the best. Hope you treated Dad special today! Click here to see the video of our recent baptism Nags Head style! Song "Carried Away" by Sonic Flood. A Sign the Economic Stimulus is Working! So this is how it works! Thanks to my friend Terri in Tulsa. She actually went into the store and came out with a 32 oz. 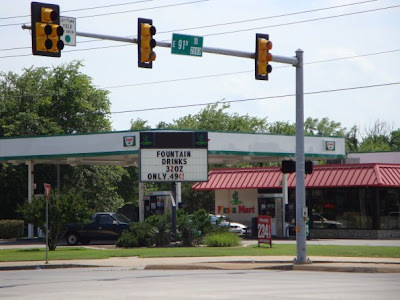 fountain drink for a penny. But she doesn't think they understand why. 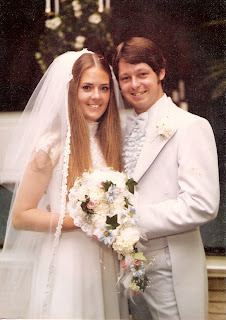 It's hard to believe that it was thirty two years ago today this lady became my bride. We've been coast to coast and continue to have lots of adventures, especially as our family expands and changes. At a slower pace, we continue to "Climb the Hill Together"*. *from the song "Let Us Climb the Hill Together" by Paul Clark that was sung by True Vine at our wedding. I also sang this song to Gail at our 25th anniversary celebration in Mt. Currie, BC. Yesterday I went into our local Post Office (USPS) to cash a postal money order (issued by the USPS) my nephew received from his dad. Actually I went twice. The first time was about 9:20AM and I was told it couldn't be cashed because they "didn't have enough money in the register". Anyway, I said, "That's OK (not enough dinero in the register), I'll come back later." They know me well in this Post Office. So, mid-afternoon I returned, presented the money order, was asked to endorse it and put my drivers' license number under my name. No problem. Then the clerk called the post master to the counter and asked if she could cash this for me. "Of course! We know Pastor Rick!" They have this machine that they feed the money order into which is supposed to read the serial number off the front, telling the computer in the register how much it is for and recording the transaction. They tried for ten minutes to get the machine to read the money order to no avail. Every time it just spit it out. I wondered aloud, "Can you manually put in the number?". They tried but there wasn't a way to do that. So finally they suggested I take it to my bank and cash it. Now, this was a post office issued money order. Their computer should have been able to accept it. But, I thought, if this was my business, I wouldn't send my customer away telling him "Sorry". I would have said, "Here's your cash. We'll figure this out later", kept the money order and sent me on my way. But, the Post Office is a government owned business. So I'm really scared for our banking and automotive industries now owned by Uncle Sam, and for our health care system, should it be taken over by the feds. Will they be run just like my post office? How many people will be turned away by doctors who have the ability to do the surgery but the system requires them to say, "Sorry". We have the best medical/health care in the world. Sure, there are shortcomings, but do we really want to be told that our surgery or care is denied because the system doesn't work? By the way, my bank quickly cashed my money order. They didn't have a US government provided machine to run it through. I have to add this: I like all the folks who work in our PO. It's the system that doesn't work, not the kind men and women there. I'm sure they had no choice but to send me elsewhere. Today's been a long day, but like most, has been full of good things. Nate put together a great video along with a cool new song, "Carry Me Away" that had references to God's waves and being carried "out to sea". It got a standing O at the end of the first gathering, celebrating the obedience and public profession of all those who were baptized last Sunday. There was also applause when I mentioned that yesterday our volunteers finished about 75% of the framing for the new Kid Zone upstairs. When it's finished it won't be a day too soon. Again we had to turn away pre-schoolers from Lil' K because there just wasn't room. Moses' story continues to fascinate me (if no one else!). Every week I continue to learn something new about God and this journey I'm on. I confess, until studying for today's talk I never realized that God stood on the Rock at Horeb before Moses struck it with his staff. Nor did I know that was the position of a servant that God took, a picture of Christ, who came to serve, not be served. And only after the Rock was struck did it gush life giving water. Again, like Christ, who had to be "struck" on the cross before the Holy Spirit could be freely given to all who believe. What an amazing God we have. After the second gather our ministry team leaders met for lunch and some communication and strategizing. These volunteers pour a lot of time and effort into ministry at NHC, and are a fantastic team to serve with. Thanks to Nathan for leading today's meeting and for some very practical leadership tips and to our hospitality team for organizing the food. It was my turn as a pastor to meet with our Parent Pod on the beach tonight during Contagious (our youth group). We talked about purpose - helping their kids find their's and the purpose of being the parents of adolescents. Great group! Topping off the day Gail and I had dinner with some pastor friends and their wives at Outback. Good fellowship, lots of laughs and sharing some hard-learned lessons. Now we're watching the ending of "Lonesome Dove" on AMC. Great saga of what it means to have vision. Just don't leave the speling up to them! The wealthy rancher needed to hire a new driver for his family's carriage. Three applied for the job. The interview consisted of one question: "You are driving my family on a mountain road that had no shoulder, and going off would mean certain death. How close to the edge can you drive my carriage and feel safe?" There is among the Christian community, especially among pastors who desire their churches to be "relevant" or "contemporary", a mindset that the "edgier" a ministry can be, the more effective it will be at its purpose (whatever that might be). I should add that the trend seems to be most prominent in younger pastors. It's an "anything goes" or perhaps more aptly, "everything goes". I'm all for relevancy in churches. I believe most churches in my circles today, though they may be orthodox in their faith, are lost in the past, which explains their decline and inability to reach the non-churched population in their communities. The church I pastor seeks to be "contemporary in our methods yet unchanging in our message". Sunday, for example, our band (a full rock-style band) followed my talk (ie. sermon) with a secular song that worked perfectly with the message. So we do tend to be "on the edge" in many regards. Whether we eat or drink or whatever we do, it should all be for God's glory. Building a reputation for being the "shock and awe" church that is the most entertaining show in town is fluff if that's your goal. This implies that some things can glorify God; some things only glorify man. It doesn't matter how good and slick our presentation if God's Spirit isn't the power behind it all. We strive at NHC for excellence. At the same time, if a church is poorly organized and led and flies by the seat of its pants I doubt God is involved. He does all things well. But it's not by might or by (our) power. When we get so enamored with our skills, our magnetism, our daring, our charisma and our perceived success that we as pastors begin to believe everyone who tells us how wonderful we are, we're ready for a big time fall. I've heard the pedestal called "The Glorification of the Worm". I'm not that good, no matter what others say. Ego and pride are dangerous traps. Just because we are bold enough to try new things doesn't make us superior. There are churches that are conservative and traditional in their methods and are knocking the ball out of the park. Chances are they are also not only practicing excellence but have found their niche in reaching a segment of their community that a church like mine isn't reaching. And that's a good thing. We're on a team here. When your search for relevance requires you to throw out all standards of what is appropriate it has become inappropriate. But who decides that? See my first point. I don't have to use certain questionable language, for example, to communicate God's Word even though in today's culture it is acceptable. Isn't part of what we do the idea of raising the bar? Back to the story. The first driver said, "I could confidently drive within 1 foot of the edge and feel safe". The second driver said, "I could confidently drive within six inches of the edge and be safe". The third driver said, "I would stay as far away from the edge as possible." He was hired. Here's my point: if our purpose becomes being edgier than anyone else in town, could it be that we may very easily go over the edge and destroy everything, including people's lives and faith. Pushing it to the limit may go beyond the limit and bring it all crashing down. What a day! I got to meet so many people today who found their way to NHC while on vacation. Some were tentative: "Do I need to wear my earplugs?". (When someone asks me that my usual answer is "Probably!".) Others brought a great spirit in with them, ready to worship, like our new friend Kurt Beach. His joy at simply being alive is contagious. Mike and his First Impressions team were as usual, on top of their game today. It's important to us that not only does everyone who steps out of a car in our parking lot get more than one sincere welcome, but that we are prepared to have them as our guests. Great job. Even with one of our coffee pots out of order, the Hospitality team had the java flowing this morning. And I even sampled a sweet potato ham biscuit. I slipped in on Kidmo at the end of the second gathering and saw about 5 groups of kids seated on the floor around their leaders going over what they had learned this morning. The room was full of elementary students and teens and adults who love them. And your new Kid Zone shirts are the bomb. The band was dead on today, not that they aren't every Sunday. But each song connected us with the Lord and with the message today. Great guitar work today, too, although I'm wishing for a little more volume from the bass...(I want to feel it). The message from Exodus 16 was intended to cause us to evaluate our obedience. Partial obedience is disobedience. And when we complain to our leaders we're really complaining to God. After the second gathering we headed to the beach where Steve (and a lot of help from Chris and others) baptized I guess a dozen new disciples. It was so great. The water was beautiful and the joy of going public with their faith spread to all of us watching, even, I think to those there for the beach today (and there were a lot). Our Contagious Youth started meeting tonight at the beach, which they'll do through September. It's a perfect day out there. I think I'll go join them! 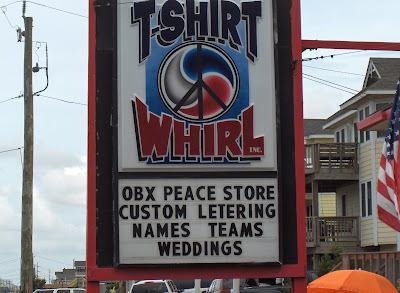 This summer I'm posting about the absolute dumb things I see vacationers do while on vacation here on the Outer Banks. Most of them will be things that could be deadly. I think they check their brains on the other side of the bridge. And I'll update it as I see stupid stuff that I have to believe people wouldn't do at home. If I can identify where they are from, I will. Tonight on the way home (headed north) on 158 a car from Maryland headed south and the driver decided he wanted to go north. So he pulled a U-turn in the middle of the highway and into my lane right in front of me. I had to go from 50 to 20 in short order. It was one of those little square cars with no acceleration. Then a quarter of a mile later he turned right off the highway as slowly as possible. Hey, it's not a side street; it's a highway. And figure out where you're going before you get on the road. Growing up the love of my life was baseball. I lived for the arrival of spring and the smell of saddle soap being rubbed in my glove and the crack of the bat. (This was before the use of metal bats that “ping”). At night I would take my transistor radio to bed and listen to the broadcasts of the Washington Senators games (so you know imagination was crucial) until I fell asleep. Baseball brought my imagination to life. I pictured myself striking out the side or making the spectacular play in the field. But my favorite “dream” was probably what every ball player imagines: being up to bat with two outs in the bottom of the last inning. The bases are loaded and my team is three runs behind. With a full count I hit a walk off grand slam, winning the game. It’s like the ultimate scenario on the ball field. Maybe you watched it Sunday night, but in the College Softball World Series that’s pretty much what happened to Ali Gardiner of the Florida Gators. Against their fiercest rival Alabama, and against the nation’s top senior pitcher, with two outs in the bottom of the last inning she hit the walk off grand slam that eliminated Alabama and propelled her Gators forward. It was one of those almost unbelievable-can’t happen-but did moments in sports. I’ve watched a lot of ball games in my life – thousands I guess – and it ranks right up there as one of the greatest endings imaginable. What makes the story even a bit more thrilling is that the walk off game winner was Ali’s first hit in the Series. She had been hitless in her last 9 at bats and was only 3 of her last 34. As her team mates watched her last at bat they knew like she did that she was in a slump. But this was the opportunity every ball player dreams about. And this dream came true. But I’m not a sports writer, so there must be a parallel here to living with God’s purposes. Do you ever imagine what God must be like? Or do you imagine what He might be able to do through you to make a difference in this world? That doesn’t mean imagining is pointless; it simply means no matter how great our imagination might be, God is greater still. Your ability to imagine or envision or dream – however you want to put it – is part of God’s creativity in your life. Could it be that people of faith never reach their full potential in fulfilling the purpose of God in their lives because we don’t imagine enough? Are our “dreams” so small that they stunt our faith?